Amid violent protests, the doors of Sabarimala temple in Kerala opened on Wednesday for the first time since the Supreme Court lifted the centuries-old ban on entry of women of menstrual age but by available indications none from this age group made it to the famed hill top shrine. Women journalists were heckled, their vehicles smashed and young female Ayyappa devotees turned back as hordes of activists of Hindu fringe groups besieged the road leading to the temple, abode to Lord Ayyappa, its eternally celibate deity, officials said. Chaos and mayhem on the road leading from Nilackal, the gateway to the shrine, 20 km away, to Pamba in the foothills from where the devotees start the arduous 6-km trek to Sabarimala reigned supreme, as activists of fought pitched battles with police, leaving many injured and bleeding. The Pathanamthitta district authorities promulgated prohibitory orders under section 144 CrPC banning assembly of four or more people in strife-torn Pamba and Nilackal following the violence and a strike called by right wing outfits on Thursday. Activist Rahul Easwar, a front-ranking leader of the protesters and votary of continuance of the tradition barring girls and women between 10 and 50 years from entering the temple, a custom which the Supreme Court overturned on September 28, was arrested at Pamba. Incensed over Kerala’s Left Front government’s decision not to file a review plea against the Supreme Court verdict, protesters pelted police with stones and the latter hit right back with vengeance wielding batons with telling effect, leaving many fallen and writhing in pain on the road. Several protesters were seen being bundled into police vehicles, while siren blaring ambulances carried some to hospitals. Simmering tension prevailing in Nilackal since morning erupted into raucous rowdyism as scores of activists of fringe groups heckled women journalists of at least four national TV channels and vandalised their vehicles. Protesters wearing black and saffron turbans chased their cars, violently pounding and kicking the vehicles in a bid to stop them from proceeding to Pamba from Nilackal on way to Sabarimala. At least 10 people from the media, including reporters and photojournalists, were injured and equipment of several of them damaged, senior minister EP Jayarajan said. Denouncing the attacks on media, he said cases were being registered against the suspects under sections relating to non-bailable offences. 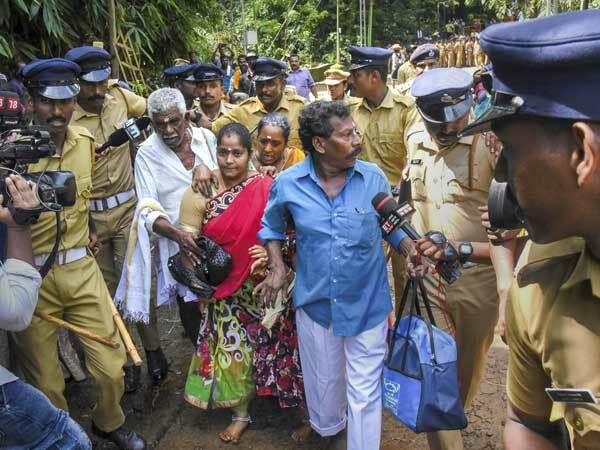 Unfazed by the unfolding violence, Madhavi, a gutsy woman from Andhra Pradesh in her 40s, tried to trek the Sabarimala hills to reach the Lord Ayyappa temple but was forced to return to Pamba, menaced by agitated male devotees. Liby, a woman from Kerala’s Alappuzha, also in the 10-50 year age group, was prevented from proceeding to Sabarimala at Pathanamthitta bus terminal. She was escorted to safety by police. State Congress working president K Sudhakaran led his party workers in a protest at Nilackal to express solidarity with Ayyappa devotees. An embattled Left Front government reacted sharply to the protests, with the state’s religious trusts minister Kadakampally Surendran calling them “politically motivated”. Surendran, who reviewed the situation and preparations for the three-month-long Mandalam-Makaravilakku-festival beginning November 17 at Sannidhanam (Sabarimala temple complex), said the government would tackle the agitation politically. “The BJP-RSS are trying to create tension and destroy the peaceful atmosphere in Kerala for political gain. We know the agenda of the RSS and BJP very well,” he said, and insisted the government did not want any confrontation with believers. The BJP rejected the allegation, saying the government was responsible for the “collapse” of law and order. Even as streets in Nilackal and Pamba erupted in tumult, thousands of bare-chested Ayyappa devotees waited patiently in the vast concourse outside Sabarimala for its gates to open at the appointed hour — 5 pm. Carrying “Irumudikettu” (the sacred bundle containing ghee-filled coconuts they offer to the deity), they calmly walked past security personnel to take their place in the long queue where they would wait for hours on end for a glimpse of Lord Ayyappa. Though older women and very young girls could be seen in the crowd, none of menstrual age was spotted.